What is it like to be in your Emergency Department as a child? 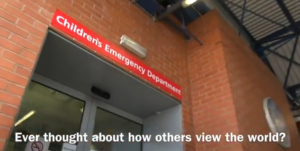 The resource is a short video clip designed to give healthcare professionals a better understanding of children’s experiences of visiting an emergency department by filming from their viewpoint. This film can be used as part of the Induction programme for new staff working in an emergency department, and could be adapted and reproduced for staff working within the ward and outpatient environments. The resource was created by Leicester Royal Infirmary – East Midlands Emergency Medicine Educational Media Production.